Bram Stoker, the father of modern vampires, forever changed the world when he penned Dracula. This legendary author created a masterpiece, one that continues to inspire people today. While most of us have read Dracula, watched the film adaptations and so on, very few know anything about this influential author, so here’s a look into the life of Bram Stoker. 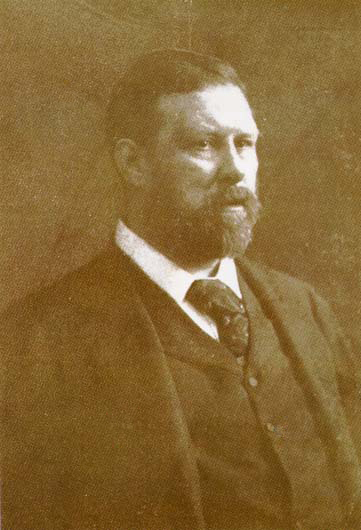 Bram Stoker was born in Dublin, Ireland on November 8, 1847 to Abraham and Charlotte Stoker. He was a sickly child and wasn’t expected to survive, so he spent most of his early years confined to bed. Funny thing is that he later turned out to be a fantastic athlete. While stuck at home with his illness, Bram often listened to his mother’s Irish folktales and her stories on the awful cholera epidemic in Sligo in 1832, which later inspired Bram’s tales of horror. He was said to be a very shy person, that he preferred the company of books over the company of people. Early on he expressed the desire to become a writer and in November 1864 entered Trinity College. During these college years Stoker attended a performance at the Theatre Royal, where he first saw the great actor Henry Irving. His interest in Irving led to him becoming a drama critic for the Dublin Mail in 1871. During this time he began to write penny dreadfuls (horror stories that cost a penny each) and his first novel, The Primrose Path (1875) was serialized in the Shamrock. The following year Stoker finally met Irving, whose appearance eventually inspired the writer’s character, Dracula. In 1878 Bram Stoker married Florence Balcombe, a stunning woman whose former suitor was Oscar Wilde. On December 31, 1879, Bram and Florence’s only child was born, a son whom they named Irving Noel Thornley Stoker. At this time Bram was no longer working for the Dublin Mail, instead he was working as an acting manager at Irving’s Lyceum Theatre (a job he held for 27 years). He continued to write while working for the theater, writing a series of stories, Under the Sunset (1881), which included one part inspired by his mother’s cholera account. In 1897 Dracula was published. I was believed for some time that Stoker wrote the book hastily, supposedly beginning it in August 1895 while on vacation at Cruden Bay. Recent studies have said that he probably began his research as early as 1890. Stoker met Arminius Vambery, an expert on folklore, in 1890 and no doubt learned plenty of information that he could add into Dracula. His research took him all over, like Whitby Harbor, where interestingly enough, in 1885 the shipwreck of Russian schooner Dimetry took place, which just so happens to appear nearly identical to the Demeter in Dracula. He also conducted research at the British Museum and the London Zoo. He acquired extensive research on medicine, folklore, the supernatural and Transylvania. While in Whitby in 1890, he read the Account of the Principalities of Wallachia and Moldavia by William Wilkinson, a onetime consul in Bucharest. In the writings, Stoker was introduced to Vlad Tepes (aka Vlad the Impaler) who was once ruler in the region – he was also called Dracula, meaning “son of Dracul.” By 1892 his notes contain clear references to Vlad. In May 1897 the novel was published in London. Bram Stoker continued to write other novels and short stories after Dracula, including The Mystery of the Sea (1901), The Jewel of the Seven Seas (1903), The Lady of the Shroud (1909) and his last work, the Lair of the White Worm (1911). After suffering a number of strokes Bram Stoker died at No. 26 St George’s Square on April 20, 1912. Some claim that the cause of death was due to tertiary syphilis. He was cremated and his ashes were placed in a display urn at Golders Green Crematorium. After the death of his son, Irving Noel Stoker, in 1961, his ashes were added to that urn. The original plan had been to keep Bram and Florence’s ashes together, but after Florence Stoker’s death in 1937 her ashes were scattered at the Gardens of Rest. a powerful vampire that is staked by slay-d by Van. People have a way of making a small story turn into a very big one and all that talk turns,a story, into thear reality. It is always good to remember, that Stoker´s vampire was Transylvanian Count whose first name we never know, not Walachian prince Vlad. They are not the same person.